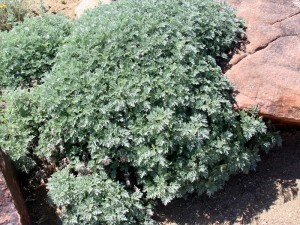 Silver Sage is a dense, mounded, evergreen shrub with soft silvery leaves. While the tiny flowers of this hybrid are insignificant, its attractive foliage makes it a star. The aromatic foliage is finely cut like filigreed silver lacework, making this plant suitable for moonlight gardens, rock gardens, containers, or to complement other flowering plants and grasses. Striking next to dark-leaved plants, silver sage is also a perfect complement to plants with red, pink, purple, or blue flowers. Prune it back in early spring to about 6 inches (never to the ground). Loves full sun and good drainage. The Autumn Sage attracts hummingbirds. 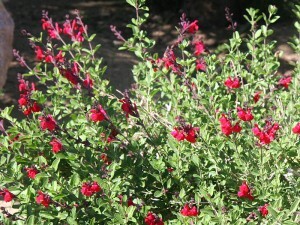 Autumn Sage is an erect, bushy, evergreen shrub whose scarlet red flower spikes attract hummingbirds. Its long flowering season extends from late spring, through fall, and even into winter in our area. Prune old flowering wood by half after flowering declines to start a new flush of growth, usually in mid-February, mid-May, and late August. 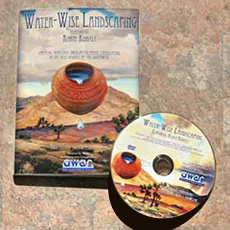 This valuable xeriscape plant loves hot, dry areas, and requires well-drained soil. Autumn sage is great for hummingbird and butterfly gardens, and is effective when planted in masses. Plant near paths to enjoy its clean fragrance. 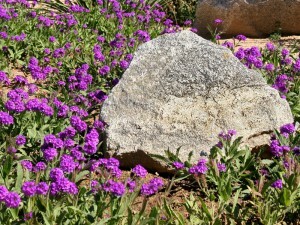 Sandpaper Verbena is a showy groundcover, with large, rough sandpaper-like leaves and ruffled, purple flowers in spring, summer, and fall. It is very hardy, resistant to rabbits, and attractive to butterflies. Sandpaper verbena plants can be grouped together to form a continuous ground cover and used on banks or slopes for erosion control. Cut it back to the ground if it looks ragged (usually in fall or winter), and fresh growth will sprout from hardy underground stems. Native to: So. 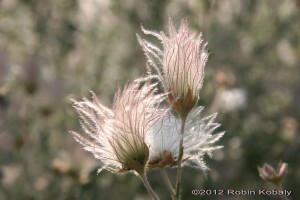 Calif, SW U.S.
Apache Plume is one of our showiest native desert shrubs. Rose-like, white flowers in spring produce eye-catching, silky pink seed plumes from May to December, said to resemble an Apache headdress. This fast-growing, semi-deciduous shrub with dark green leaves is extremely tolerant of heat and drought, and is an important erosion control plant. Apache Plume likes full sun but accepts part shade, and needs only occasional if any irrigation after it becomes established. Give this plant ample room—it doesn’t stay small for long. Damianita is a cheery, compact evergreen shrub covered with yellow, daisy-like flowers from April to September. 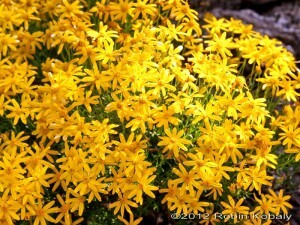 While Damianita is technically a shrub, it is used like a flower, creating a vivid, yellow carpet when massed. Planted in groups, Damianita forms a ground cover useful for erosion control on slopes. Its tiny, dark green, needle-like leaves are wonderfully aromatic. Damianita requires full sun, little water, excellent drainage, and soils not amended with organic matter. Light pruning in early spring promotes denser new growth, but severe pruning may kill the plant. A perfect border plant for flower beds, or a ground cover for hot, exposed areas. Its rounded form gives a soft contrast to yuccas and agaves in desert gardens. Rock Roses are sun-loving, fast-growing evergreen shrubs with furry gray-green leaves and showy pink, purple, lavender, or white flowers. 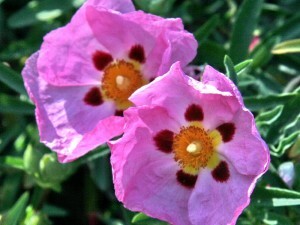 Purple rock rose is a compact shrub that thrives in poor, well-draining, dry soils, and full sun. Although each papery flower lasts only one day, these bushes produce a seemingly endless succession of flowers from spring through early summer.